The train journey from London to Frankfurt-am-Main is very easy. Eurostar trains from London connect very efficiently at Brussels Midi station with Deutsche Bahn ICE high-speed trains to Frankfurt. There are three departures each day from London St Pancras to Frankfurt via Brussels. Rail tickets from London to Frankfurt via Brussels normally go on sale three months prior to travel. On your journey from London to Frankfurt by train, you’ll speed across the territory of four countries: England, France, Belgium and Germany. As the latter three countries are all members of Schengen, there is little by way of border formalities. Additional options from London to Frankfurt via Brussels are available with a further change of train in Cologne. There is also a useful routing via Paris. Both these alternatives are normally more expensive and slower than the journey described below. Board a Eurostar service from London St Pancras to Brussels. Little more than an hour after leaving London you’ll already be in northern France, speeding through Flanders fields towards Lille Europe, where almost all Brussels-bound Eurostar trains make an intermediate stop. Some trains make up to three additional stops – at Ebbsfleet, Ashford and Calais. From Lille, it is just 35 minutes to Brussels, where Eurostar trains terminate at Brussels Midi station. Trains run every five minutes from Brussels Midi to Brussels Central (for the city centre). 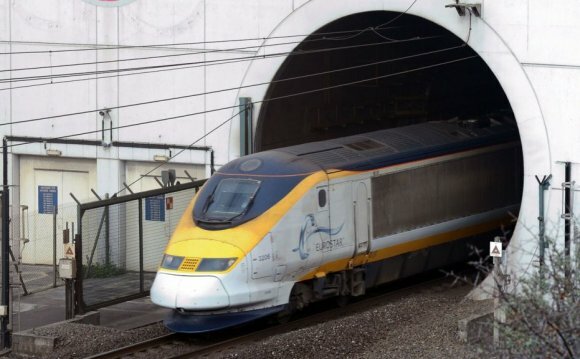 Your Eurostar ticket is valid for this short onward hop within Brussels. Remember to factor in at least half an hour for Eurostar’s airline-style baggage check prior to boarding your train. This is a light-touch security scan, and there are no restrictions on taking liquids on board Eurostar trains. The direct ICE trains from Brussels to Frankfurt am Main take about three hours for the journey. These trains stop five to eight times along the way. In Brussels these services depart from Brussels Midi and then also stop at Brussels Nord. In Frankfurt trains stop first at the airport station, then continue to the city centre station (Hauptbahnhof) where they terminate. The route east from Brussels initially traverses the flat lands of Brabant to reach Liège-Guillemins station. East from Liège, the train cuts in tunnels through hilly country to reach the German border just before Aachen. Beyond Aachen, the train speeds east to the Rhineland city of Cologne, arriving at the city’s main station (the Hauptbahnhof). From Cologne, the train continues along a new high-speed line to Frankfurt. Train surfing is riding or climbing ("surfing") on the outside of a moving train. This activity is illegal in many countries and is prohibited by administrative law. Sir Anthony Nathan de Rothschild, 1st Baronet (29 May 1810 - 3 January 1876) was a British financier and a member of the prominent Rothschild banking family of England. Emma Hindle (born 19 May 1975) is a British international equestrian. She first rode for her country in 2004, competing in the World Equestrian Games of that year, and competed for Great Britain in Dressage at both the Athens and Beijing Olympic Games.